I've been having more fun with the washi tape that arrived from Freckled Fawn a few weeks ago. I made a birthday card for one of my daughter's friends. I was inspired by one made by Nicole Heady. 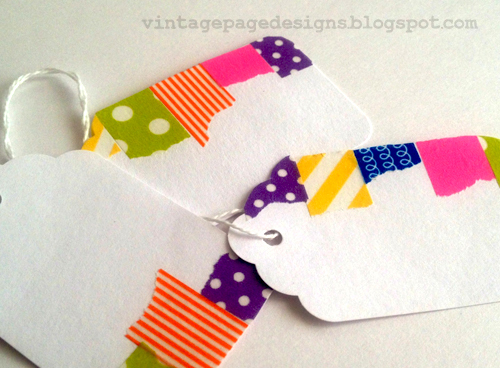 And with the scraps that were left over, I created some little gift tags. 1. Prevent the tape from lifting up by rubbing firmly with a bone folder to secure it to the card stock. 2. Prevent your scissors becoming sticky by using teflon coated non-stock scissors to cut your tape. Sweet card and great tips! I haven't worked with Washi tape much, so the tip about using the bone folder is great. Marvelous colors on the card and great idea for using the left-over scraps. so super cute!! i only have 2 rolls of washi tape but i have TONS of scraps this would be perfect for! !